Erivan and Helga Haub began collecting Western art in 1984, although by then they had been acquiring the work of the European old masters for over a decade and therefore had already developed a keen eye for collecting. What makes this collection of Western art unique is the Haubs were born, raised and live primarily in Germany, coming to Wyoming each summer to spend time in the landscape and culture they fell in love with. As a result, the Haubs have amassed one of the most important collections of Western American Art in private hands with the assistance of their friends Ted and Christine Mollring, former owners of Trailside Galleries in Jackson Hole and Scottsdale. However, most importantly, the Haubs have always collected what they love and through this have created a unique vision of the West. People of the West- A Collector's Vision invites the audience to view the cultural traditions of the West as interpreted and inspired by the artists. 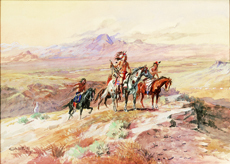 Depictions of American Indians, from the plains and pueblos, and the western cowboy are represented in both iconic imagery and in the storytelling tradition. Portrayals of the soldier in the West and the encounters between them and the American Indians are seen from both points of view, along with the rarely depicted images of Hispanic life and traditions. The works included span from the early explorer artists to contemporary, all working in a variety of mediums. This wide-range of artists included establishes a broad sense of the West and reveals the importance, culturally, socially, visually and historically, of Western art as a genre. 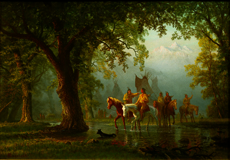 The University of Wyoming Art Museum is privileged to present a selection of the Haubs Collection of many crucial works by some of the most significant Western artists held in a private collection that the public would not normally have an opportunity to view. Funded in part the National Advisory Board of the UW Art Museum. 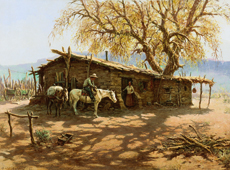 Collectors Erivan and Helga Haub discuss collecting, Western Art, and Wyoming.